If you’re like most dog owners, you don’t want your pet confined in a small space all the time. You need a nice playpen that offers lots of space and open air, which you can use anywhere. And if you’re looking for a great playpen, the IRIS Plastic Pet Playpen 8-Panel is an excellent option and is one of our best dog playpen selections. This playpen is a longtime favorite among dog owners, and is very highly regarded. It’s a well established absolute classic that continues to get rave reviews online from its latest buyers. So what is it exactly about the IRIS Plastic Pet Playpen 8 Panel that has dog owners enthusiastically taking the time to leave mostly positive recommendations? Let’s take a look at the advantages and features. Some playpens offer meager space, which may suffice for small dogs and puppies. But even average-sized dogs need a lot of room to play and stretch their legs. That makes many crates unsuitable. But this 8-panel pen provides a large enclosure that’s big enough for most dogs. Since the pen measures 63”L x 63”W x 34”H, you get an area that measures more than 21 square feet. That’s enough space to place even 2 dogs inside, so they can play together. That’s assuming they’re friendly of course! But what if that’s not enough? IRIS has anticipated that possibility, and that’s why there’s an option to purchase a 2-panel add-on extension pack for this 8-panel enclosure. Some buyers however have been even more ambition and purchased 2 8 panel packs and linked them together to create a massive playpen. You may think that such a large enclosure also comes with an inflated price. On the contrary, it doesn’t. You could easily spend more on some of the dog crates on the market. 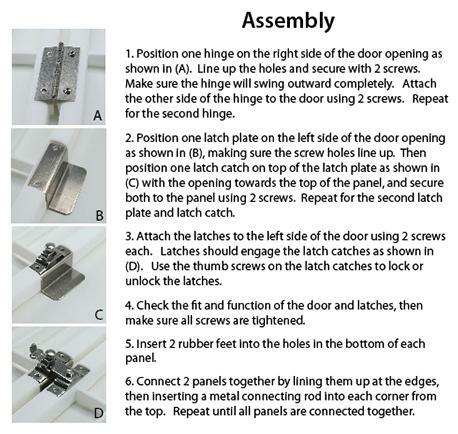 Not everyone is a DIY expert, so it can be a bit discomforting when you buy a product that requires assembly. But there’s no need to worry about this when you get the IRIS playpen. You’ll only need a screwdriver to easily attach the latches, hinges, connecting rods, and rubber feet on the fence. The instructions are very easy to follow and you can do this in a few minutes all by yourself. If even touching a screwdriver makes you nauseous however, then there are alternative pens that are even simpler to put together such as the Midwest Black E Coat Exercise Pen With Step Thru Door. The play pen comes with a door, to allow for easy access to and from the crate. The latches and connecting rods are very strong, and the heavy-duty plastic used for the fence is adequate for a crate trained dog. When you use this indoors, it won’t slide on the floor since it has non-skid rubber feet at the bottom. And even jumping dogs may find it very hard to escape from this enclosure. It’s almost 3 feet high. Although if you do have a determined jumper, you’re out of luck with this one, as there doesn’t appear to be a top on sale for this model, unlike the IRIS 4 panel playpen which does have an optional top available, or the Midwest Exercise Pen. A great aesthethic advantage of the IRIS Playpen is that it looks really pleasant. Especially in contrast to a crate that can look very harsh. Especially crates in the common dark grey color or unpainted metal finish. You also have a choice of 9 colors for it to suit your fancy. The finish lasts for a very long time, as reported by many pet owners who’ve had this pen for years. The sides also have those nice gentle curves at the top, so it looks like a nice yard section. It doesn’t look harsh or unpleasant at all. Instead, it actually looks nice and homey. It resembles a stereotypical picket fence. Put this outside and it will enhance the look of your yard. Some people like to buy American-made products because they feel national pride. That’s nice, but others are more pragmatic. They buy products made in the US because the quality is perceived to be better. That’s pretty much evident in the IRIS playpen. It’s made in the US, which no doubt helps with its quality and popular appeal. The reason for its durability is that IRIS carefully choose their materials and design. They use heavy-duty plastic for the fence, and that means it won’t rust, warp, or bend, while also keeping costs reasonable. It can withstand high impacts too. It also uses reliable double steel door latches for greater security. If you’re not going to use this play pen for an extended period, it’s not a problem. You can easily detach the panels from each other and stack them flat in your cabinet or garage. Once you need it, it doesn’t take long to put it back together again. You can move it indoors and outdoors easily, depending on your needs. This also means that if you want, you can easily take it with you to the park or on vacation. It’s very light and the flat storage means that bringing it with you isn’t a problem at all. The IRIS Plastic Pet Playpen 8-Panel has been garnering rave reviews for years since it was first introduced. At first, people loved the usual things—it’s affordable, easy to assemble, spacious, and great-looking. But interestingly. Of note are buyers that returned years later to update their original review to express their delight at how well the pen has lasted. What’s more, buyers of this crate have also found IRIS customer service to be great. Some customers have found that IRIS were willing to replace lost or broken components even years after buying their unit. That said, the pen is not suitable for escape artist dogs that haven’t been crate trained. For owners of such dogs, they did not find the pen strong enough, with some pets managing to break out or, jump over the top. So only buy this pen if your pet has been crate trained, and will readily understand that the pen enclosure is his or her private space to stay within. And not a challenge to try to overcome. Another issue for people that may want to expand the pen is that the optional 2 extra panels to widen the pen may only be available in select colors. We’ve seen them only them in white, dark grey, blue and pink. So while the choice of 9 pen colors is great, if you think you might want to expand the size of the pen in future, then you’ll probably want to only purchase one of those 4 colors. It’s no wonder that this playpen gets thousands of positive reviews online. It’s truly a great playpen. You just need to make sure that your dog isn’t too big or too rambunctious for it, and it’ll serve its purpose well, while looking great. Buy this playpen for your dog, and both of you will enjoy it tremendously.